Escape into the depths of northern Arizona's canyons where realities change and spirits are healed. In the wake of the Great War Carley Burch finds herself dreaming of wedding bells and city life with her fiance, Glenn, in the wonderful metropolis of New York City. Carley is a dandy little gal, caught up in a superficial ego groomed for city life with an independent woman's purse. If only Glenn felt the same way. Searching for meaning to his life and to his experiences in the war, Glenn leaves New York for the dusty, untamed lands of Arizona. Can Carley convince him to come home or will Glenn be able to show her why she needs to stay? This was my introduction to Zane Grey, one which started a long lasting love affair of westerns. 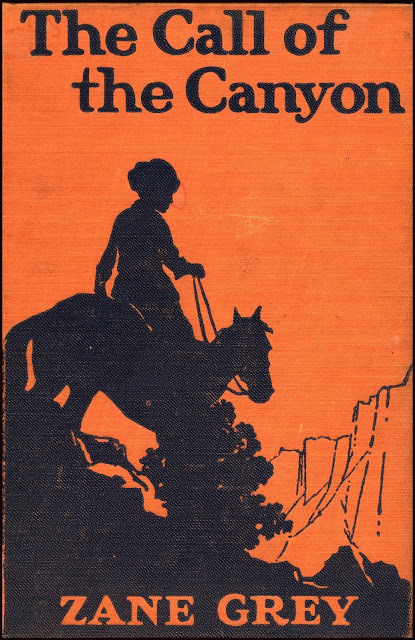 It also holds the title of being my favorite Zane Grey novel and for many reasons. The story alone is compelling, humorous, and relevant, however, my absolute favorite element of The Call of the Canyon is Grey's reference to what we now know as PTSD. When Glenn returns from the war and is expected to act happy-go-lucky like all the other young men who (unlike him) were able to dodge conscription because of wealthy fathers he suffers from a great depression which his doctor attributes to shell shock. The end result is a decline in his overall health centralized in his lungs - the after-effect of being gassed while out in the field. The remedy? Move to Arizona where the west is still a little wild, where he can build his strength in the dry, arid climate, and step away from the business of the city. Another favorite point is the main character, Carley's, transformation from a tease of a tart to a well rounded, insightful human being. It's a transformation completely relevant to today's social climate as well as the mind games women play with men. As a whole, her experience has a way of acting as commentary on our own lives. It's just beautifully done. If you've never read a western I recommend starting with this one. There's adventure, love, humor, and life lessons. Grey is masterful in describing the environs of Arizona, as is his way - the landscape acts as more than a backdrop, but rather a leading character in each of his novels. It's inspiring. Not interested in westerns at all? Have you ever tried one? It's ok - drink the kool aide. Grey will take good care of you.